When I started the conversion 4 years ago there was only 1 option for a cheap ECU this was a megasquirt unit and at the time there was megasquirt 1 and 2. 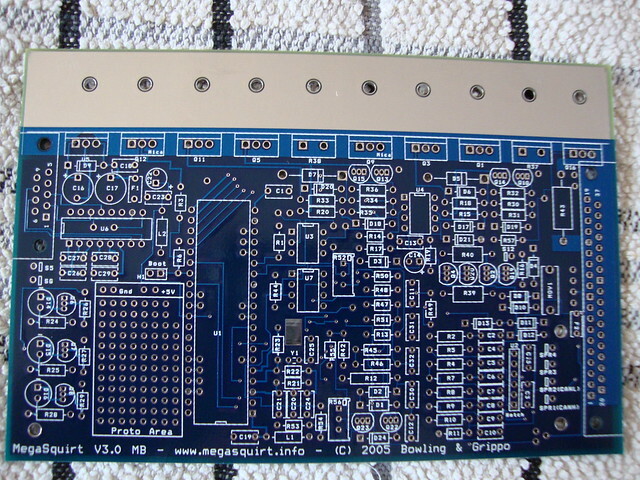 I went for megasquirt 2 with version 3 PCB, the reason these ECU offer good value is that you have to build the main board yourself (main processor is ready assembled). 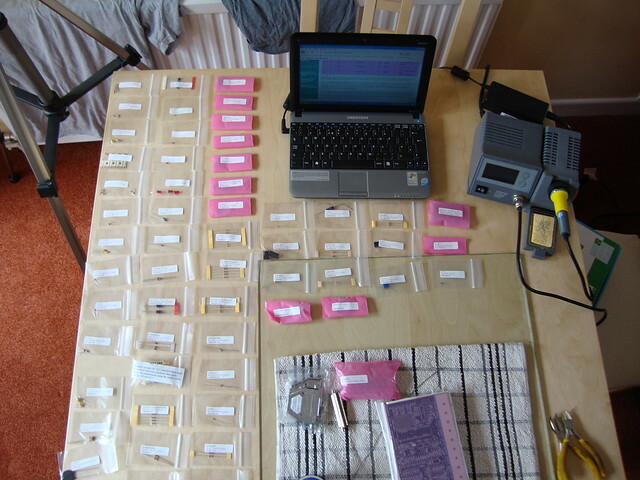 I ordered the complete kit with the Jimstim tester. 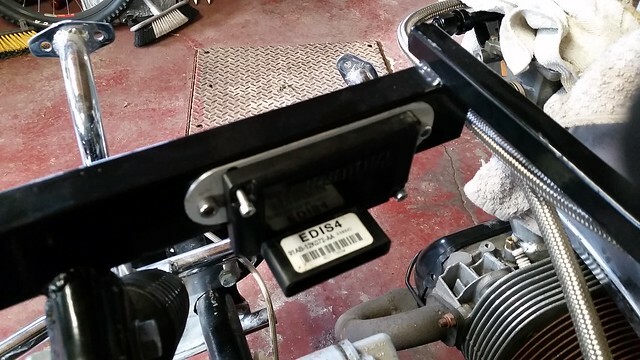 With the EDIS system the ECU was simplified which meant very little modifications needed. Once the ECU was built I then inspected all solder joints and setup the Jimstim to test the ECU, all tests completed it as then time to clean the board I removed the main processor and using electrical cleaner removed any flux left from the soldering once dry the ECU was assembled into it case and processor installed for the final time. On the VW beetle engine I like the look off the twin carburetor setup but this is also linked with distributor, fuel pump and linkage system all showing at the back (in the beetle this doesn’t matter as it covered but on the Trike it all exposed) so it needed to be simple and twin carb looking but injection and cheap. 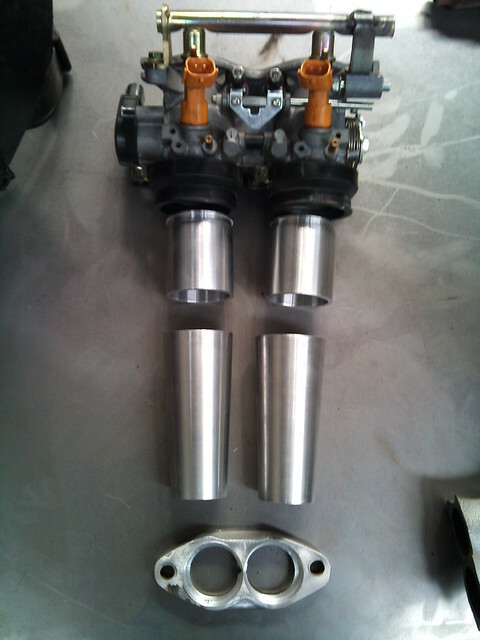 After some looking I found a set of Honda CBR400RR throttle bodies with injectors for £10.50 of EBay. 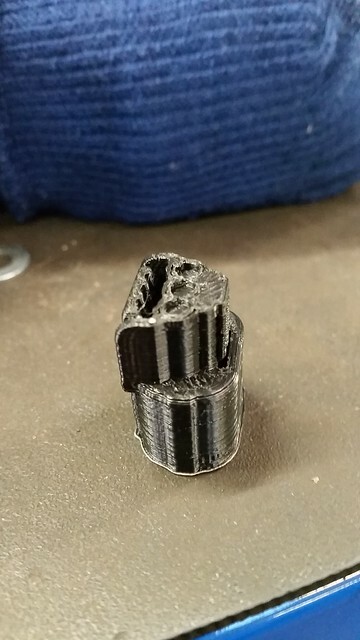 These are used on a inline 4 cylinder engine but looked like they could be split, after receiving them they do just unbolt in half and provide 2x 2 cylinder throttle bodies, there are some issues the idle speed adjustment screw was only on 1 half with a link rod connecting all 4 together and the fuel rail linked all 4 together. 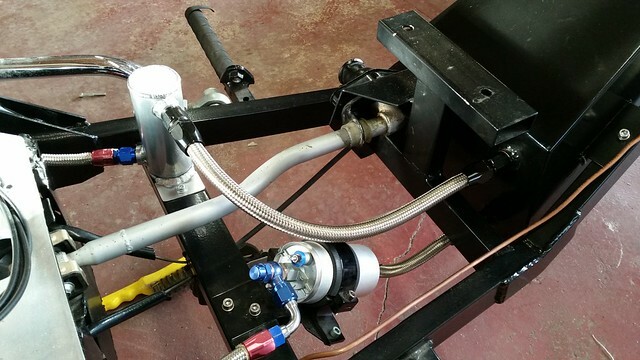 Fuel rail was simple cut in half and add the 4th missing mount to hold in place as it made off steel I welded on some an-6 fittings to each end and did away with there fuel pressure regulator. This gave me a nice neat looking all in 1 throttle and injector unit with a Throttle Position Sensor (TPS) built in. 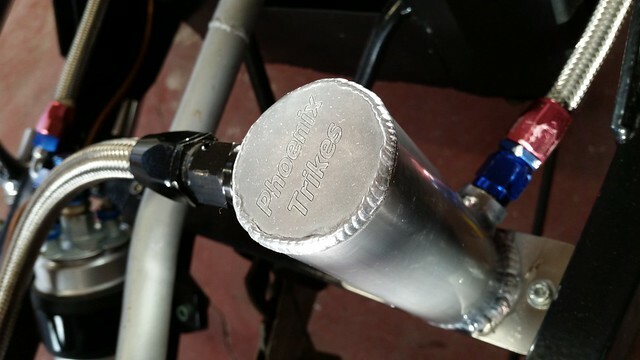 Because the Trike had a carburetor before the fuel system needed quite a few changes. First change was the going to be cosmetic (aero filler cap). Because there was not enough clearance between the body and tank I notched the top of the fuel tank to give me enough room to flush mount the filler cap. While the fuel tank is out I changed the small feed and reverse outlets to an-8 these will now be feed and return for the fuel injection system. 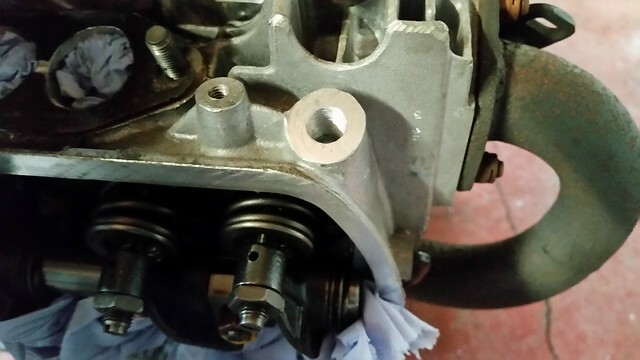 The lower fitting go straight into a high pressure fuel pump this then feeds a fuel filter then into the first throttle body round to the next throttle body then on to a fuel pressure regulator and should be straight back to the tank but as the old fitting was a reserve port it only just above the fuel out and I was worried about high pressure return fuel disturbing the fuel out. I decided to make a little swirl pot to slow the return fuel down and stop it disturbing the fuel out. This also takes the an-6 hose and converts to an-8 for the tank. For the ignition system I wanted to run wasted spark and do away with the distributor to keep the engine looking very clean. 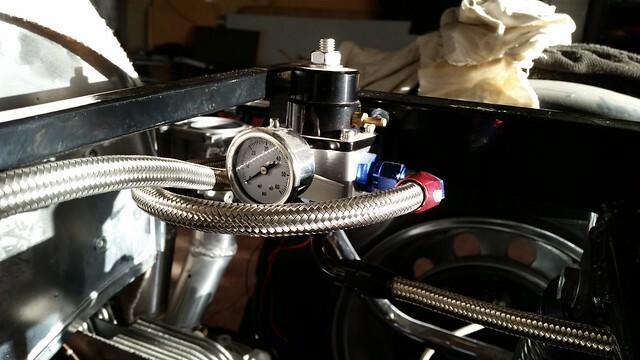 When the project started the most simple way was to use the Ford Electronic Distributor Ignition System (EDIS) this setup only requires a crank sensor input (No cam sensor is needed). 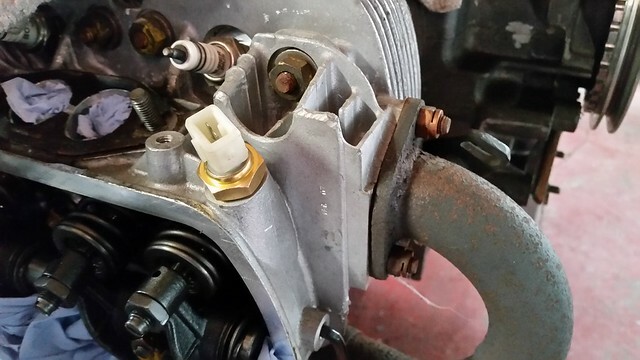 The Variable Reluctor (VR) crank sensor provides a signal from a 36-1 crank wheel mounted on the crankshaft, this signal is sent to the EDIS module that’s turns it into an RPM signal for the ECU, the ECU then provides a saw signal back to the EDIS to alter the ignition timing to the wasted spark coil pack. The first job was to mount the 36-1 pickup wheel as the engine never came with one. Most conversions bolt this to the back off the crank pulley but as the Trike engine is on show I didn’t want this sticking out so I decided to mount it between the engine and pulley, this in turn made fitting quite difficult, we machined the back off the pulley to give us a flat surface then a spacer was made then using some aluminium, small neat grub screw secured it all together. Then the block of aluminium was machined to act as fuel pump blank and VR sensor mount. 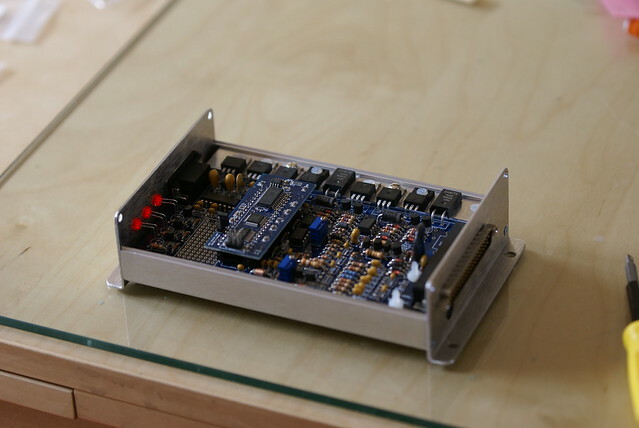 A Mount was made on the main Chassis for the EDIS control unit. 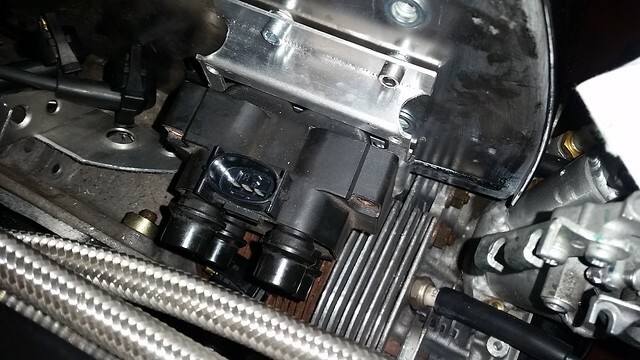 I then made a mount on the back off the fan housing for the wasted spark coil pack a set of Ford plug leads connect to the Beetle spark plugs. A blanking bung was made for the hole where the distributor used to fit. Throttle Position Sensor (TPS) this was easy as it came fitted on the throttle bodies (or so I thought). Until I tried to get the connector for the for the TPS, it took about 5 wrong connectors until I found what looked like the correct one, the only problem was the only place that sold them was in America and the connector was very cheap ($3) but with $15 shipping I didn’t want to order without checking, the company that makes the connector (sumitomo) have 3d drawing the only software on my computer that would open it was my 3d printer so I decided just to print it out. With a 3d printed connector it fitted the TPS so I ordered my connectors. Coolant Temperature Sensor – As the trike is aircooled there no coolant but still need to give the ECU a temperature reading there debates on to what to measure (Oil or Cylinder head), looking at some newer fuel injection beetle engines they run a sensor in the head that pokes into the oil system by the rocker cover as my engine was a brand new Mexican engine it had the boss for this sensor built in, so after drilling the boss out and tapping the correct size thread I screwed the new sensor in. 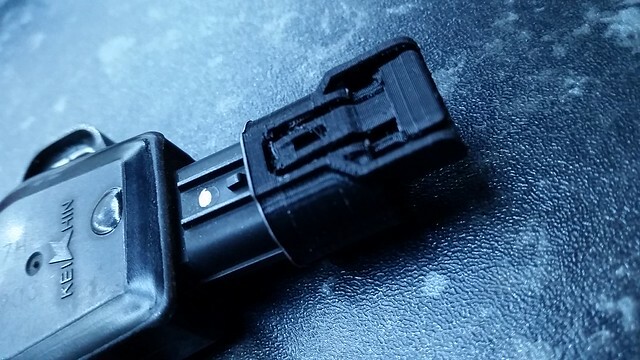 this sensor is going to be a VW open end IAT sensor this will be mounted below the air filter and above the throttle body. Do to a change of plan with airfilters (the weber twin 40 air filter I was going to use hit the body) I changed to 4x little airfilters each filtering air for it own cylinder the IAY sensor was mounted in the top of one’s of these airfilters. 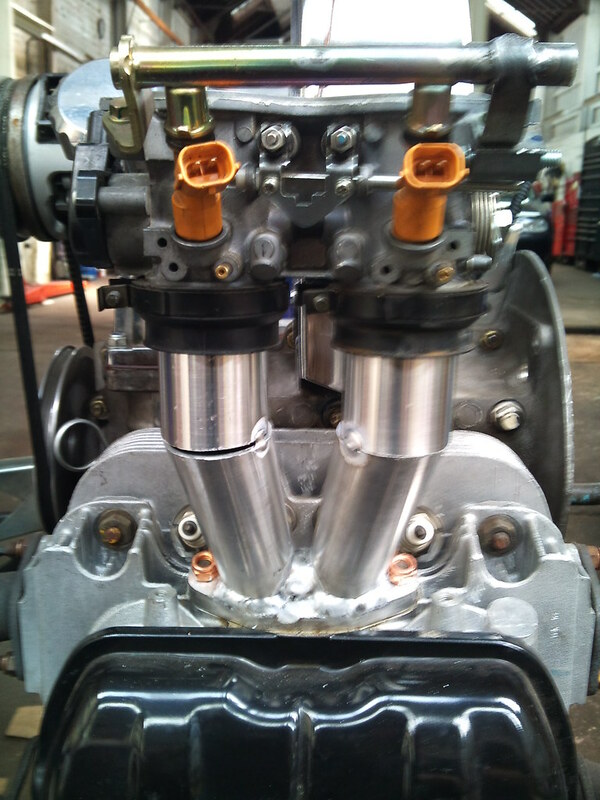 This is located in the ECU and the throttle bodies had vacuum ports on each one. So pipes run from each throttle body to a 5 way adapter and then onto the ECU.